Due to the weather, we have rescheduled the August Reading Invasion at the Richardson Olmsted Campus for Tuesday, August 29th at 6:45. Hope to see you there, Buffalo! It’s August, and we are really excited to announced the final Reading Invasion of the summer of 2017, taking place on Tuesday August 22nd at 7pm. 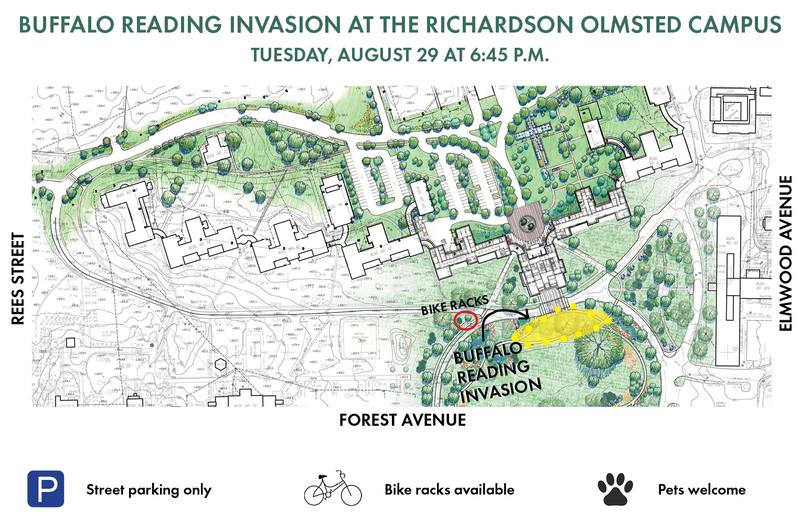 This time around, we are going to Invade one of the most exciting new spaces in Buffalo: on the south lawn of the Richardson Olmsted Campus! For those of you who haven’t visited this recently renovated and reclaimed space–and as those who were at the incredible EnLIGHTen event can attest–the Richardson Olmsted Campus is already a gem in city, and we are thrilled to be partnering with them to make this night possible. So please join on next Tuesday night for a special evening of reading, community, and one of Buffalo’s most beautiful public places. One week from tonight–on Monday July 24th at 7pm–the 2nd Reading Invasion of the summer is taking place at Broderick Park, along Buffalo’s west side. The Park, located at the foot of West Ferry St. and set beside the Niagara River, is a relatively unknown gem in our park system–and a perfect place for a night of reading, gathering, and community. We’ll be meeting at the southern end of the Park from 7pm until 8pm. There are picnic benches and a pavilion and a large grassy area along the “historic walk” to gather and throw down some blankets and chairs. Broderick Park is a historic place for its role in the Underground Railroad, and just recently got an $11 million dollar upgrade. And just last week, the Broderick Park Station–a new eatery–opened up. It will be open until 7pm on Monday, so come early and grab some food. It’s also just a beautiful spot, snug against the Niagara River, a stone’s throw from Canada, and just under the shadow of the Peace Bridge. Please mark your calendars, tell your friends, and plan to join fellow Buffalonians for a lovely night of reading and gathering. Please join us for a mid-summer Reading Invasion taking place on Monday July 24th at 7pm. We’ll be announcing the location and more details soon. Please mark your calendars, get your summer reading together, and let your friends know about the next Invasion!